Hello everyone! I'm back with another beauty review. 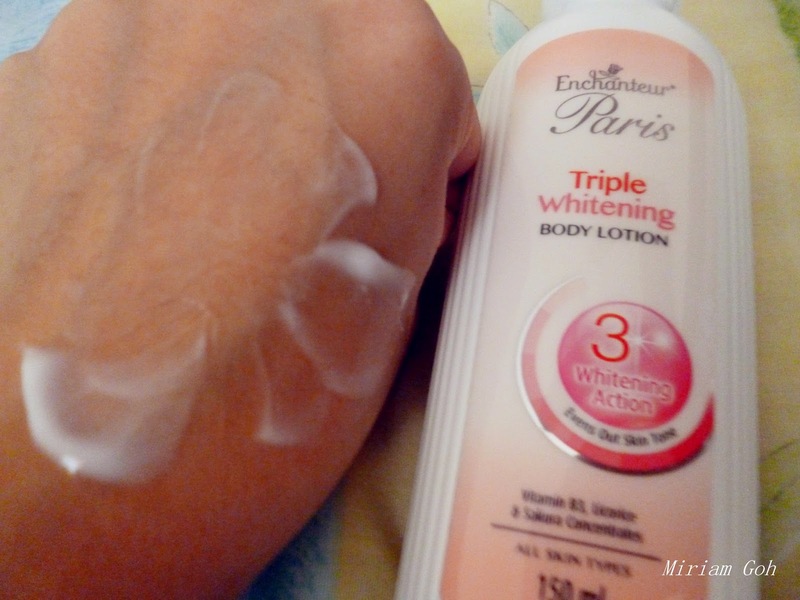 This time it is on body lotions by Enchanteur Paris! Firstly let me give you Lesson 101 on body lotions! What Are Lotions and It's Benefits? 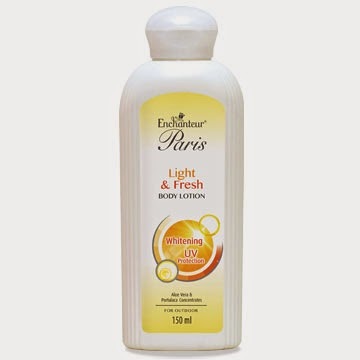 Enchanteur Paris is a range of fine quality French-inspired fragrances and fragrance-enhanced toiletries for the young, romantic and elegant female. When Enchanteur first appeared on the market I was totally swooned by the fragrance! 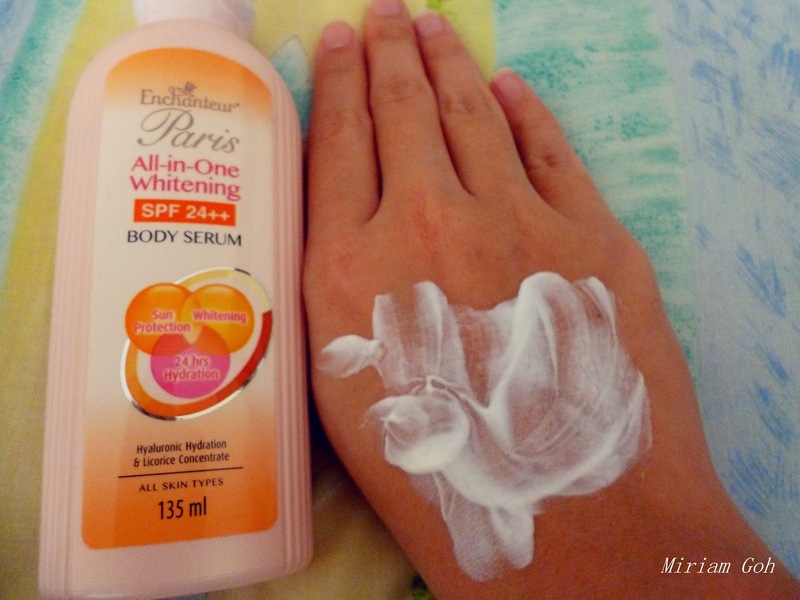 To those who love Enchanteur as well, listen up! 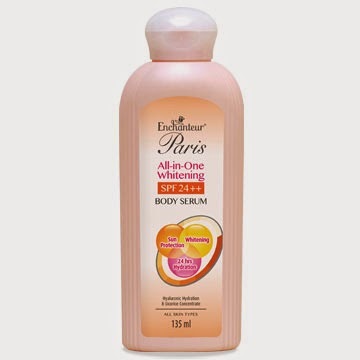 Enchanteur also has a line of body lotions suitable to moisturise your body and to give you that exclusive Enchanteur fragrance. 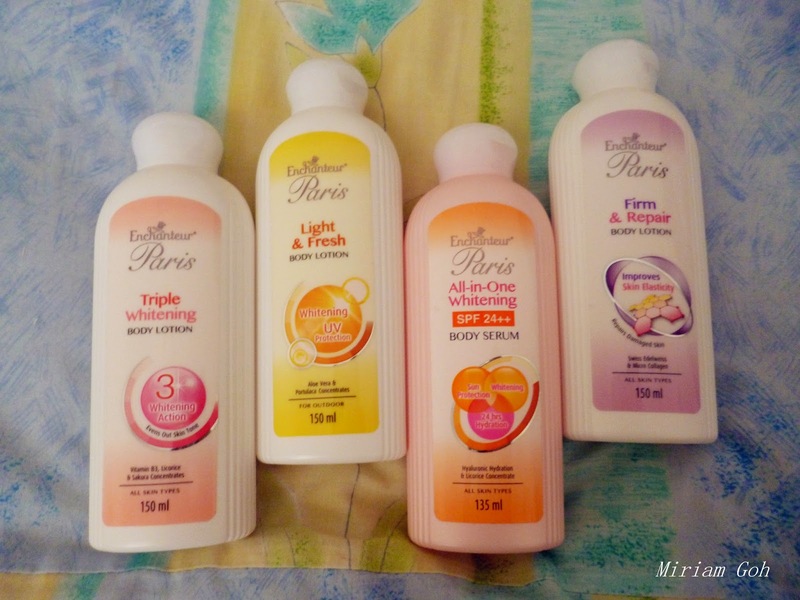 Thanks to Butterfly Project I was given the chance to review all four of the body lotion in the series! All-in-One Whitening All-in-One Body Serum giving you Multiple Benefits in 1 application for Fair, Beautiful Soft skin even if you are out under the sun. One Body Serum, Multiple benefits! Good for outdoor as it also comes in uplifting and refreshing fragrance that keeps you fresh even it is hot outside. 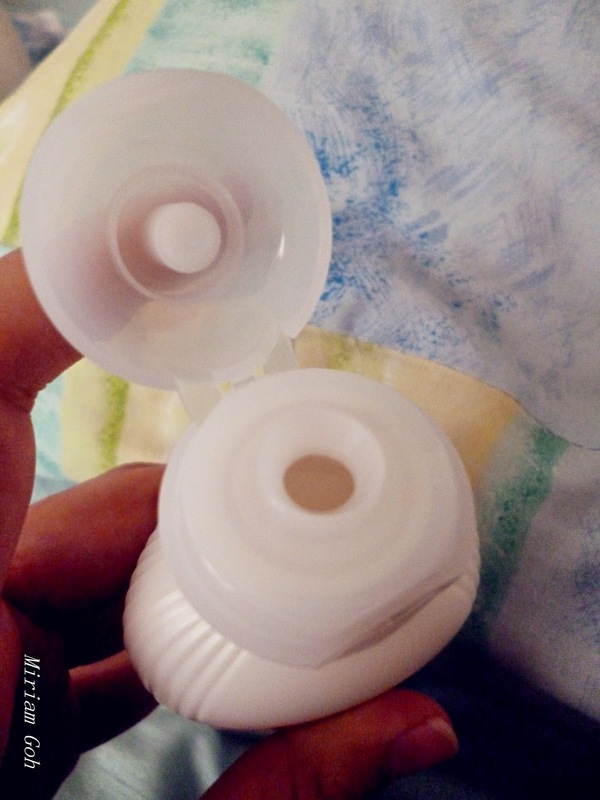 The cap of the bottle is quite tight that you do not need to worry about it spilling but I don't really like the large mouth as it was quite difficult to control the amount of lotion coming out from the bottle. 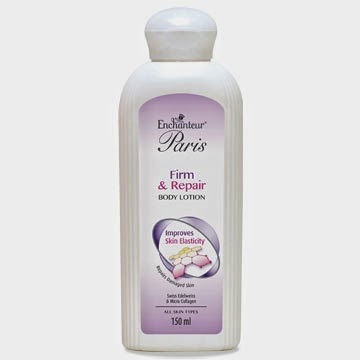 So firstly the Firm & Repair body lotion. I use this before I sleep at night as it functions to improve skin elasticity and repairs damaged skin overnight. It has the scent of Adore which relaxes you as you sleep. What I love about this Enchanteur lotions is that is is fast absorbing and water-based which does not leave your skin feeling sticky. 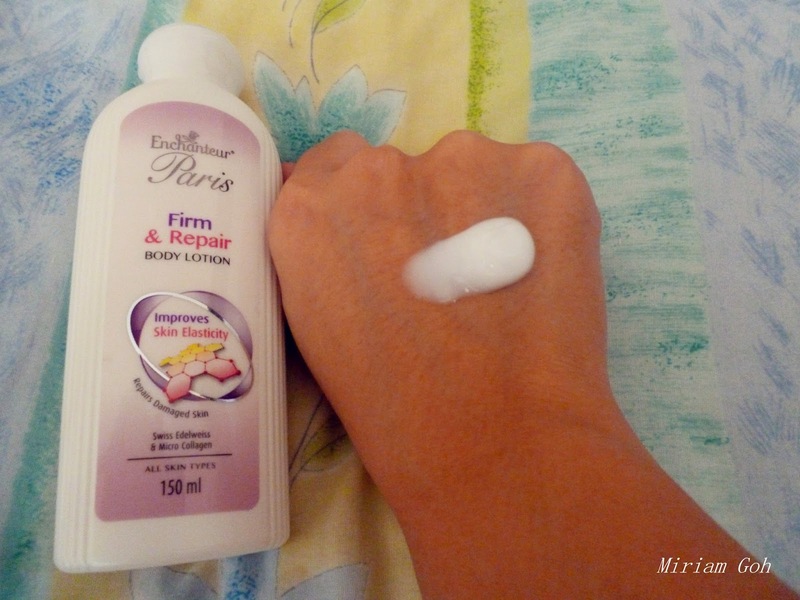 The texture of the lotion is quite watery and absorbs quickly after rubbing the lotion over your body. 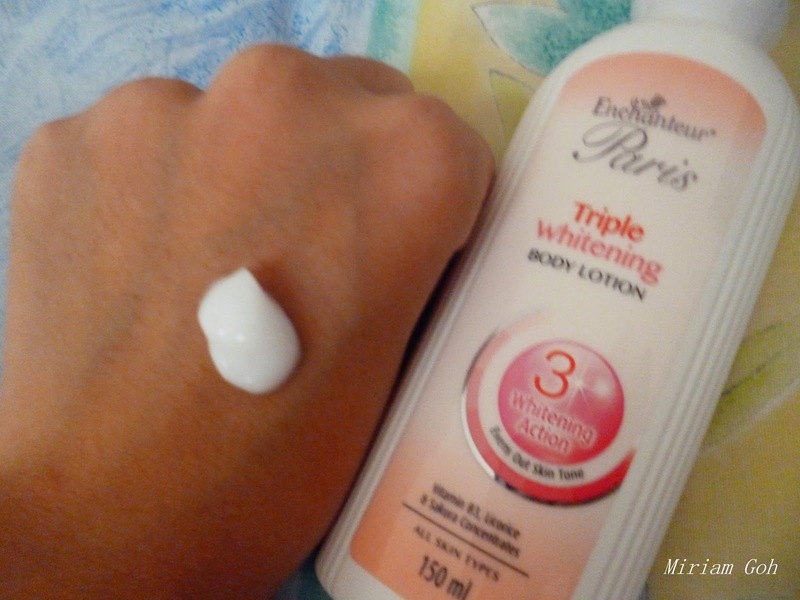 Now we get to the whitening lotion which is the Triple Whitening body lotion. 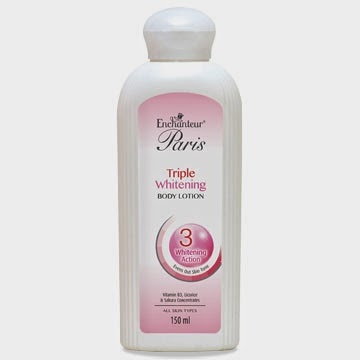 This lotion has 3 whitening action which helps to even our your skin tone. 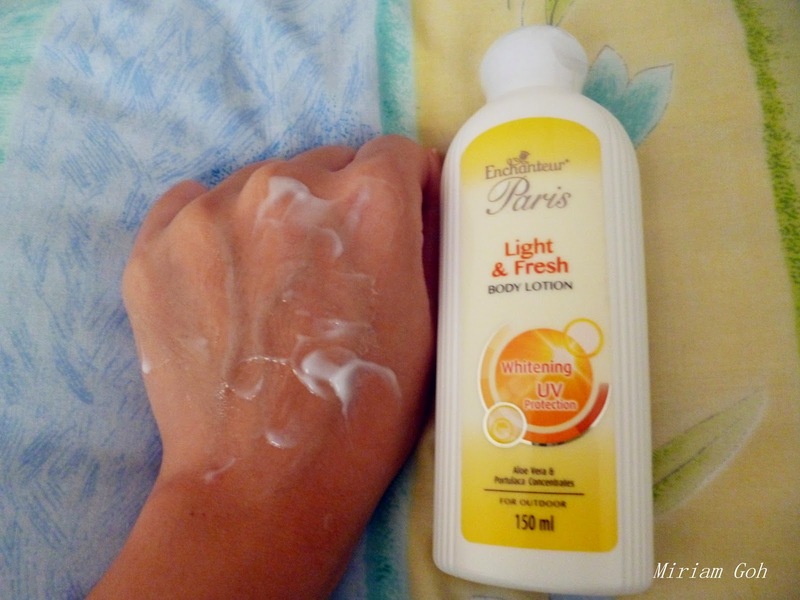 I really like this lotion as well because of its scent which is Belle Amour. It is not too strong and really calming scent. 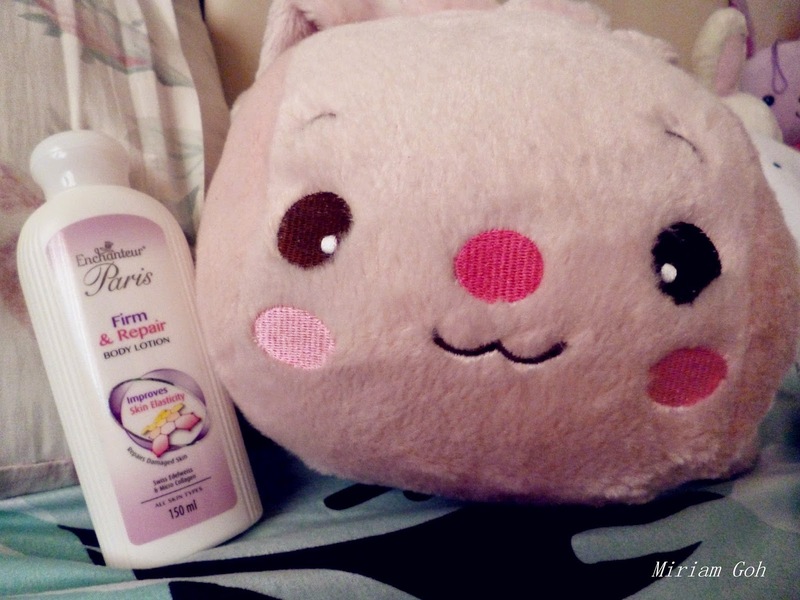 The texture of the lotion is not too thick as well and is fast-absorbing. 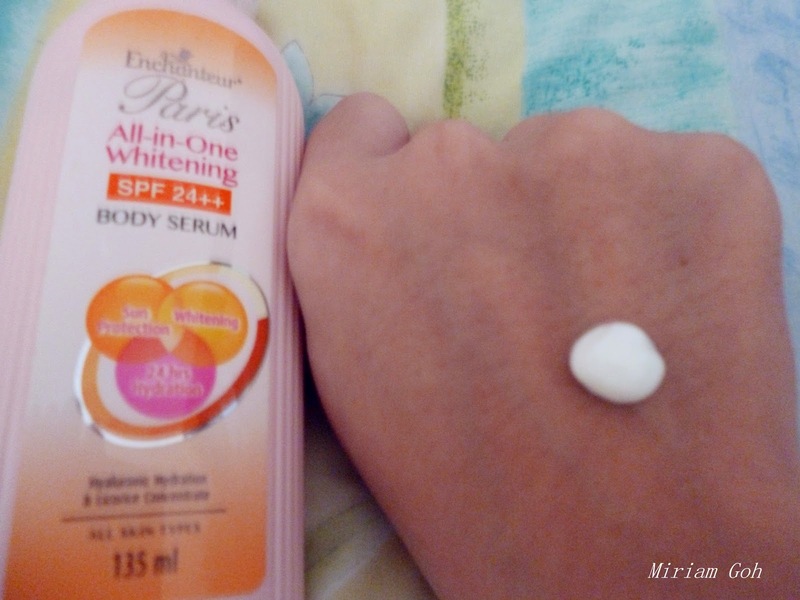 I have yet to see any effect using this lotion but I'll have to use it for a longer time to see any effect. Lastly is the All-In-One-Whitening. 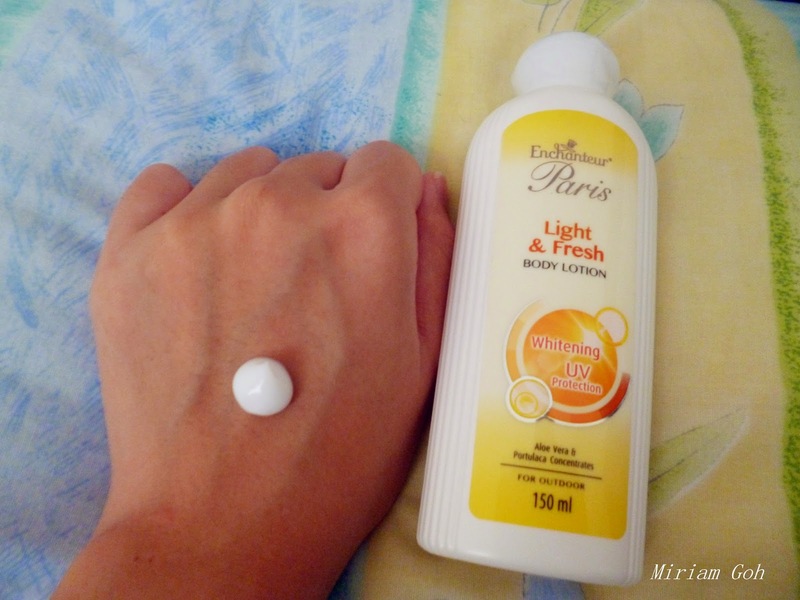 This lotion has SPF 24+++ which is useful for sun protection, whitening and 24 hours hydration. Among all four lotions, I don't really like this one because of its texture which is slightly thicker in consistency and leaves a sticky feel on my skin. Maybe it is because of the additional effect of 24 hours hydration. My skin does feel hydrated after using it but I still did not enjoy the sticky film on my skin. Among all the lotions which one do I use the most? It is definitely the Firm & Repair and the Light & Fresh. 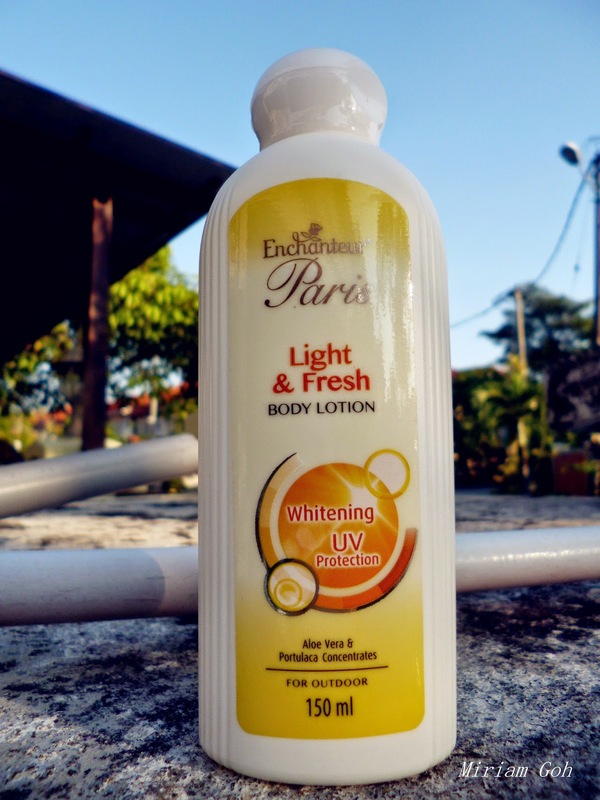 I would recommend the Light & Fresh to those who are often outdoors for that extra protection from UV rays and also keep you smelling O-So-Good!